Reference genes have become the method of choice for normalization of qPCR data. It has been demonstrated in many studies that reference gene validation is essential to ensure accurate and reliable results. 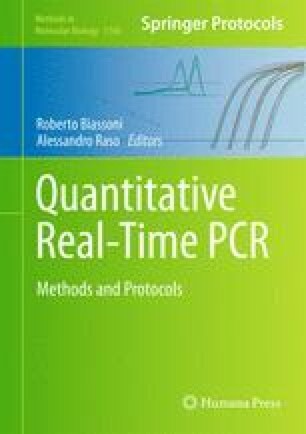 This chapter describes how a pilot study can be set up to identify the best set of reference genes to be used for normalization of qPCR data. The data from such a pilot study should be analyzed with dedicated algorithms such as geNorm to rank genes according to their stability—a measure for how well they are suited for normalization. geNorm also provides insights into the optimal number of reference genes and the overall quality of the selected set of reference genes. Importantly, these results are always in function of the sample type being studied. Guidelines are provided on the interpretation of the results from geNorm pilot studies as well as for the continued monitoring of reference gene quality in subsequent studies. For screening studies including a large, unbiased set of genes (e.g., complete miRNome) an alternative normalization method can be used: global mean normalization. This chapter also describes how the data from such studies can be used to identify reference genes for subsequent validation studies on smaller sets of selected genes.